Using electronic recording/transmitting devices, known as bugs, to listen in on your rivals activities has been a common stable of the espionage agent’s arsenal. 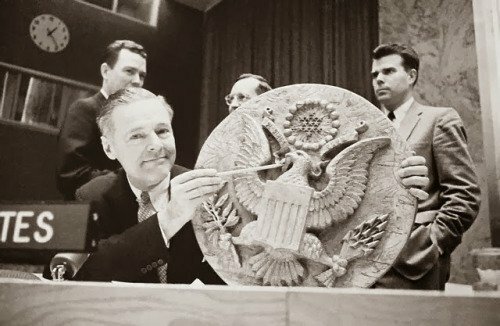 As long ago as 1946, the Soviet’s were bugging the US Embassy in Moscow (with a “Trojan Horse” type gift of a wooden replica of the Great Seal of the United States) but the most famous attempt was during the building of a new US Embassy in Moscow where the Soviets were able to wire the entire building with listening devices under the very noses of the Americans. Thankfully, for the US, the bugs were found before the embassy opened but due to the nature of their placement – in some cases, embedded directly into the brickwork – the building stayed closed until it could be entirely rebuilt and opened in 2000, some 15 years later. The agency has received intelligence that a secret meeting will be held in a rival nation’s embassy in the coming weeks. The nature of the meeting is unknown at this time but the intelligence reports indicate that the contents of it could be vitally important. The agents are assigned with covertly entering the embassy and bugging the appropriate rooms to enable a full account of the meeting to be recorded.